The system has obvious benefits, including reduced carbon emissions, greater transit use and increased levels of exercise. It has equally obvious problems. 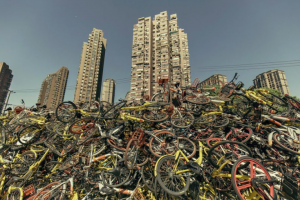 First, the massive numbers of bikes necessary to make the model work have become a public nuisance, clogging sidewalks, roads and doorways, and forcing governments across China to cap their growth. Second, nobody has managed to make any money renting out $400 bikes for pennies per hour while flooding cities with even more. Bluegogo’s collapse won’t be the last; China is home to dozens of smaller bike-shares, each of which faces the same issues. For now, China’s two dominant bike-sharing companies — Ofo and Mobike — remain afloat, supported by some of the world’s biggest and most generous funders. But the pressure to generate cash is growing and as recently as October they were in talks to merge. That would give the Chinese government something it prefers: a single entity to regulate, rather than a swarm of startups. At the same time, it’d probably come at the expense of smaller cities, which are unlikely to benefit from the economies of scale — and higher prices — possible in places like Shanghai. China’s local governments need to step in. Viewed properly, bike-shares have become a critical piece of any well-designed mass transit system — and one that China needs to maintain if it wants to meet its livability and environmental goals. If the economics don’t support private players, cities should either start their own bike shares or take over and run failing networks. Free markets gave rise to China’s bike-sharing revolution. A bit of socialism, though, may be needed to save it.